Do you carry a first aid kit on the hills? Photo: BMC. Picture the scene. You're four hours into a walk in one of Scotland's remoter hills. You're looking forward to an epic climb, a night spent warming up by the fire in a bothy, then tramping back out the way you came tomorrow. You and your climbing partner are both well-equipped, with plenty of warm clothes, food and a decent first aid kit between you. Without warning, your mate slips on a wet slab of rock and falls awkwardly. His legs are fine, but his wrist and arm hurt and with the blood dripping out of the wound where a sharp stone cut his head there's no way he'll be climbing today. The nearest road is ten miles away, and you haven't had any mobile phone signal for hours. Think you can remember how that unfamiliar triangular bandage sitting at the bottom of your first aid kit should best be tied to support your friend's arm? And how cold and wet will you both be getting whilst you rummage for a plaster big enough for the cut in his scalp which is still oozing blood? 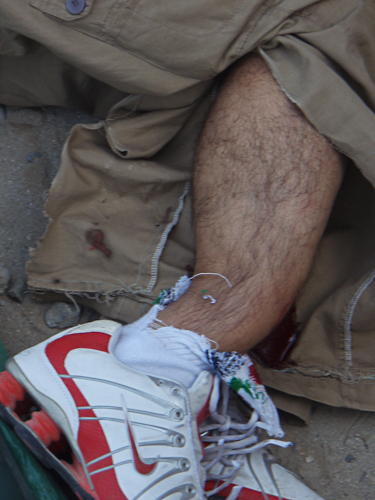 But even for serious injuries like this, simple equipment is often enough to buy time for evacuation. There are a few excellent ready-made first aid kits on the market in the UK, but the truth is the majority of them contain items which are heavy, bulky and not as straightforward to use as they need to be. The majority of people out climbing, walking, running or biking in the UK's upland regions won't need the kit to carry out field surgery – you just need enough to safely deal with common minor injuries such as cuts, sprains and blisters whilst having the basics to support a more serious casualty until help arrives. Four different sizes of crepe and triangular bandage, enough antiseptic wipes to sterilise an operating theatre, and a tubigrip are likely to be too much hassle to use for smaller problems. For more serious casualties they are often irrelevant, yet they take up valuable space and weight which would often be better used carrying an extra layer or more food to keep yourself or a casualty warm and well fed if the worst happens. If you have never learned these skills, or were taught them many years ago, seriously consider taking a course such as those taught by Rescue Emergency care or Wilderness Medical Training. You do not need to be an experienced doctor or nurse to carry out some of the basic procedures which will hugely improve the chances of a very sick patient before the emergency services can reach you – simple things like learning how to keep an unconscious person's airway open can mean the difference between life and death. 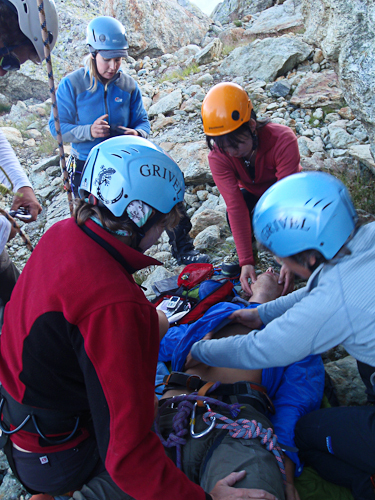 Assessing an injured climber: basic airway skills are crucial. If you do need help from mountain rescue or other emergency services, there are two things to consider – how will you attract attention; and what do you need to tell them? Many of us carry mobile phones on the hill, but these are never foolproof and problems with reception and battery life are often an issue in upland areas. 6 blasts on a whistle, or 6 flashes of a torch or mirror, are useful alternative ways of attracting attention. In some areas it may be quicker to send another member (or ideally two) of the group to the nearest house or farm to get help. Where are you? Give a grid reference, and mention nearby landmarks. If you don't have any prior training, or you're a bit rusty, it might boost your confidence to have a small laminated card with emergency instructions in your first aid kit. The BMC have also published a sample accident report form which can be printed onto waterproof paper and kept in your first aid kit, available at . An emergency might not seem like the time to be filling in paperwork but in a stressful, unfamiliar situation it often helps to gather your thoughts, ensuring that you can give the emergency services all the information they need. Other than that there is relatively little equipment which is worth carrying. Spare clothes can be used to keep casualties warm, tie on pressure dressings, protect injured areas from pressure and knocks. Ice axes or walking poles can be used as makeshift splints for broken arms or legs. A number of these strategies were used by Rob Latimer at the 2010 Lowe Alpine Mountain Marathon after his team-mate Martin Potter was involved in a serious fall in Glen Fyne – Rob was unable to find a first aid kit and his improvisation with clothes which they had carried with them kept Martin safe and warm until help arrived.